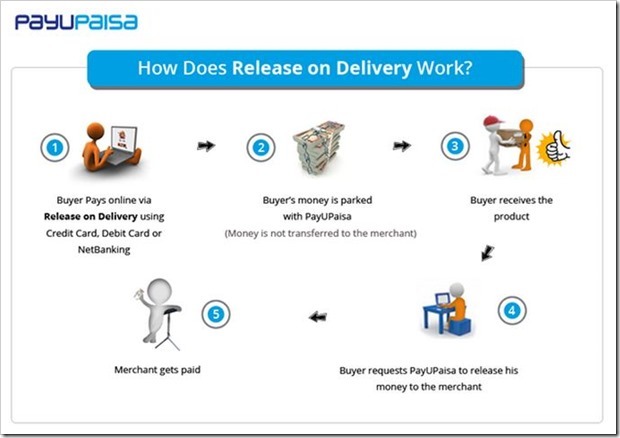 PayUPaisa, one of the leading online payment gateway in India has started offering a unique payment model for ecommerce merchants in India and it is called “Release on Delivery”. The model is quite similar to how escrow payments work – Essentially, shopper who is buying products online with “release on delivery” will first pay online for the merchandize bought, however, the payment will remain with PayUPaisa till confirmation from the buyer that merchandize bought is satisfactory. When buyer explicitly informs PayUPaisa to release the payments, only then the money is transferred to the merchant. In case if PayUPaisa doesn’t receive any confirmation from the buyer in 3 days after the product delivery, the payments are released to the merchant by default. In India, over 60 percent of transactions that happen are Cash on Delivery. Though it is great for buyers, it is a very expensive model for merchants. The average cost per CoD transaction borne by a merchant is as high as 8% to 10% (as compared to an online transaction which costs 2% to 2.5%). Due to this, merchants margins are negatively affected to a large extent. The operational cost for CoD transactions for a merchant include paying handling fees to third party courier service and costs are much higher in case the merchandise is returned back. In addition to this around 15 to 20 percent of CoD orders are not honored by the buyer further adding to merchant costs. There is another reason that CoD transactions are high in India. Buyers are still apprehensive about online purchases. They do not want to part with their monies before they get merchandize in their hand. With Release on Delivery model, those fears will be put to rest, as the money is released only after explicit confirmation from the buyer. From merchants perspective, even if half of CoD transactions are converted to RoD, they end up saving on operational costs due to CoD. From buyers perspective, they also benefit due to faster refunds and faster dispute resolutions incase of mismatched expectations of product delivery. This is a great feature introduced by PayUPaisa, we will need to see how many merchants actually implement it! 2. In case a product does not match a buyer’s expectation or did not receive the product at all then PayU Paisa dispute team will resolve the dispute and ensure you get your money back. The dispute team is a mediator who talks to both the parties (Seller and Buyer) and resolves the issue- either replacement or complete refund. 3. Refunds will happen to the customer’s account (Same mode of payment which was used by the customer). There is no CASH involved so do not get confused with COD, money will be parked in escrow and refund cane be done directly to the customer as its with PayUPaisa , not with the Seller. A seller as well as the buyer gets a dashboard. Seller uploads Proof of delivery and thats how we get to know about the delivery. 4. That’s why its not a plain bank account, rather known as Escrow account. Yes we are not banks and not holding the amount for the lifetime, only till the product gets delivered or the dispute gets resolved. Feature Phone Sales Drop For The First Time In India! Don’t you think those who are apprehensive of online transactions will have reservations to keep their money with PayUPaisa?